We all know drinking water is essential to good health. It keeps us alive and helps our body function properly. But what if I told you staying hydrated is also a good way to become more productive too? This article will show you 3 scientifically backed reasons why drinking enough water each day will help you focus better and get more done. To put it simply, your body would stop working properly without a good amount of hydration. This makes sense when you consider that water makes up around 60% of your body weight. The human body has many important functions to perform and needs water to do most of them. For example, your blood carries oxygen to all the cells in your body but wouldn’t be able to do this without water. Going on a journey of self-improvement and increased productivity is a lot easier if your body is at peak physical condition. Below are 3 solid reasons why you should make sure you get enough hydration each day if your objective is higher levels of productivity. All athletes know that failing to drink enough water means poor physical performance. This is because dehydration can have a noticeable effect on the way your body operates. 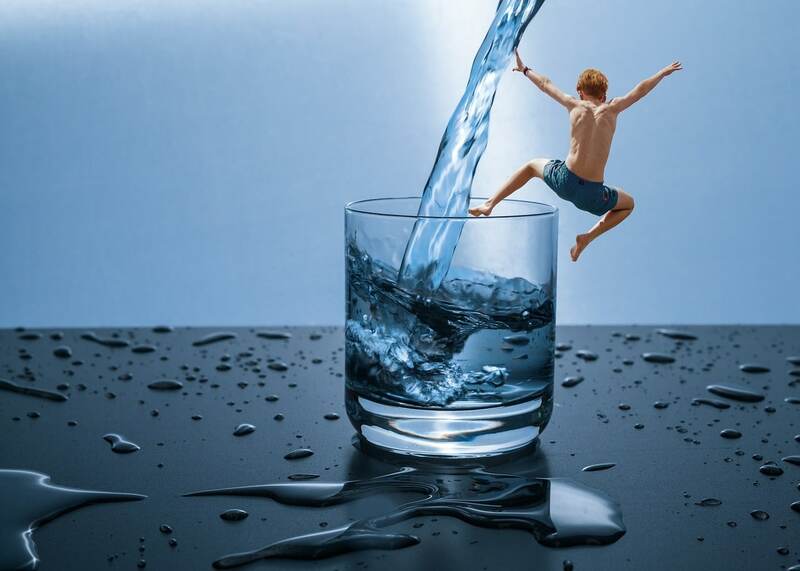 Losing as little as 2% of your body’s water content can result in reduced motivation, increased fatigue, altered body temperature control and make everything more difficult in both mental and physical terms (1). The good news is that proper hydration can prevent all this from happening. Drinking enough water may even reduce oxidative stress. This form of stress happens when you take part in any physically demanding activity. None of this should come as a surprise when you consider that your muscles are around 80% water (2). Your hydration status strongly influences your brain capacity and function. Studies now reveal that your brain function can even be affected by very mild dehydration (i.e. a loss of around 1-3% of body water weight). For instance, a research study conducted on young women who had a fluid loss of 1.36% after exercise shows they suffered from an increased frequency of headaches as well as impaired concentration and mood (3). While a similar research study was conducted on a group of young men who had a fluid loss of 1.59%. Despite this modest level of dehydration, the participants showed signs of increased feelings of fatigue, anxiety and a decrease in working memory (4). Being productive is hard enough without feeling fatigue, anxious or suffering from poor memory. These studies show that even being a little bit dehydrated can decrease your capacity to keep on top of things. So drinking a glass of water before sitting down to focus on what you want can help give you the energy to achieve your goals. Many people suffer from headaches because of dehydration. However, studies show that water is capable of not only relieving the symptoms of some headaches but also preventing them in the first place (5). Headaches are not just physically upsetting, they also stop you from getting anything meaningful done. Some migraines are so bad that they can completely knock you out and render you incapacitated for a while. The last thing you want is to be completely wiped out by a headache. Especially a headache that is totally preventable by simply drinking more water. The sad part about all of this is that the vast majority of people suffer from dehydration. Some reports claim there could be as many as 75% of US citizens suffering from dehydration that don’t know it (6). This is a huge issue when you consider how essential water is to our overall health, well being and the ability to function at full capacity. If you’re worried about getting enough hydration, a good place to start is to work out how much water you should drink each day. Do this by using a daily water intake calculator to work out how much water you need to drink according to your body weight. I recently quit soda for lent to see how I would feel on only water. Man am I in a deficit according to that formula! I find thnis topic to be actually one thing which I feel I’d never understand. Ah Simon! I wanted to leave the first comment but you beat me to it 🙂 Great to hear that you tried to quit soda, I’m sure you felt great at the end of the experiment. Indeed most people are not drinking enough water but at least you’re aware of it and so you’re more empowered to do something about it. My name is Luke and I’m the author of this article, if you have any comments, questions or concerns just post them here and I’ll personally reply. A big thank you to Erin and the team for publishing! Are you struggling to lose extra weight? Does your slow metabolism make it harder for you to lose excess weight? Have you been on the lookout for a proven Apex Forskolin weight loss product? If you answered yes to any of these questions, then you have landed on just the right page! 3 Scientific Ways Drinking Water Makes You More Productive IS THE BEST TYPE OF OF ARTICLE TO UNDERSTAND THIS TOPIC. I love this post! I have a similar one here https://wp.me/p9ksvW-eo. Check it out sometime. Nice article. I have seen other evidence and read other things that support this notion. Thank you for this article. She is very close to my topic. I’m writing articles and essays, if interested, visit my website- https://writepaperfor.me/ . Here i am posting information about the delete browsing history which is useful for us and also provide some amazing tools which helps us to clear the cache . Our body is made up of 70% of water and we need to keep drinking enough water on daily basis to keep is hydrated, But i will suggest to drink Kangen water which much more helpful and more effective than normal water. I do agree that many people suffer from headaches because of dehydration. mind. I was interested to find out how you center yourself and clear your head prior to writing. After reading all this thing I decided to stop drinking soft drinks and my decision was right due to less intake of sugar I started losing my weight. without doing anything extra, just drink enough water. be thankful if any vapers ｃould possiblү advise some fabulous companies tһat are not exceedingly popular.